﻿ Novotel Balikpapan Hotel (Indonesia) | FROM $35 - SAVE ON AGODA! 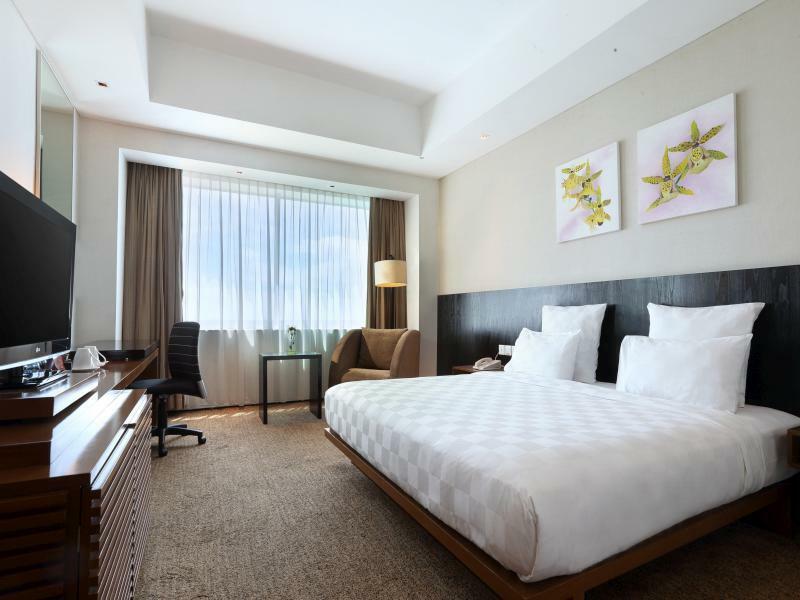 "The locations is walkable to downtown restaurants and the ma..."
Have a question for Novotel Balikpapan Hotel? "Got room with great view swimming pool and ocean." "Over all it was a nice staying." 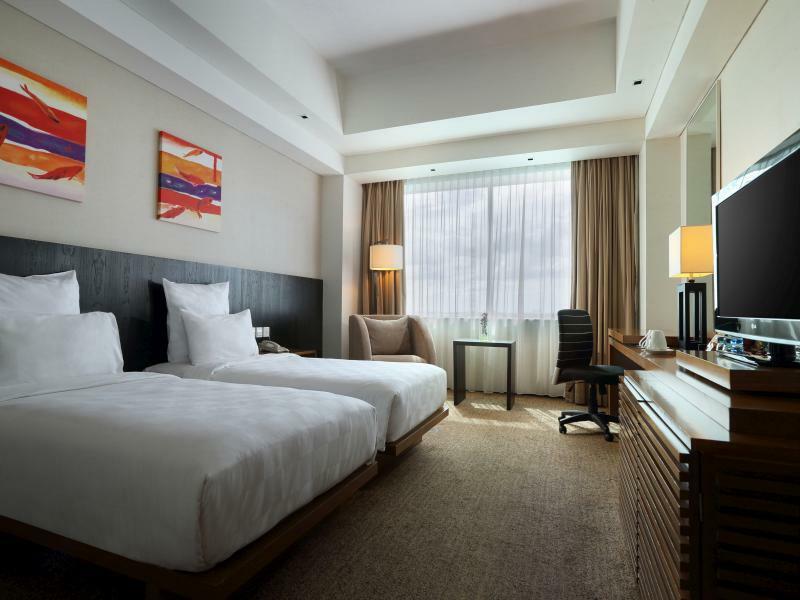 "We liked our stay, We were treated as special guest, was giv..."
A 4-star elegance in the heart of Balikpapan, Novotel Balikpapan Hotel is the gateway to the unspoilt mountains and beaches of Kalimantan. Guests are in safe hands the minute they arrive at the airport, relax on the shuttle to the hotel, freshen up with a cool drink on arrival, then be escorted by the gracious staff to the well-appointed suite that offers all the usual, first-class amenities typical of the Novotel Hotels around the world. Visitors normally arrive and leave from the bustling capital of Balikpapan, and guest returning from the wilds of Borneo will be glad of a little luxury to relax and recuperate after the rigors of travelling through beautiful, untamed Kalimantan. Our secure online booking form makes reserving your room at Novotel Balikpapan Hotel simple - just fill in your desired dates and click. We liked our stay, We were treated as special guest, was given a room with both ocean and pool view. Fir sure will stay here again if we back to Balikpapan. Rooms are a bit old but all amenities working fine, may need renovation in future but you feel living in a luxury hotel, Lots of variety of food for breakfast. the hotel doesn't give corporate rate for group booking. even though we held a wedding ceremony for my sister here.. strange....thus, we book via agoda as it is cheaper than to buy from the front desk. bring your own shower cap as the hotel doesn't provide them. Value for money for 4-star rated hotel with all facilities, comfort and clean room and also located near heart of Balikpapan. Easy to acces to many restaurant, mall and Bekapai Garden. Just take walk for a few minutes. Location, friendlier staff and excellent food. I always enjoy staying at this hotel. Food is excellent and location is very close to city center. Swimming pools and spa have also great advantage compare to the other hotel with same level. Recommended for staying for business or leisure. Convenient location in the city. Unfortunately the room was a little bit worn and furniture are rather old. Seen small roaches crawling on the wall in the room probably most stuff are wood made. Can be better maintained. Will try other the next time. 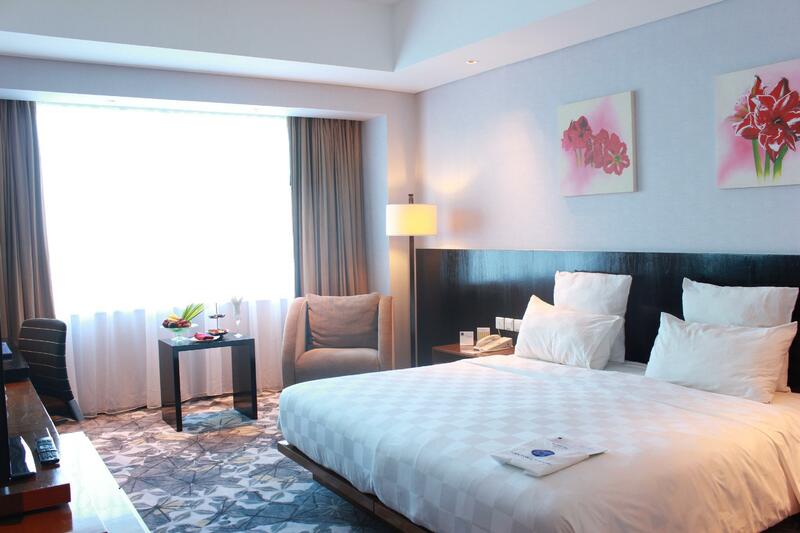 Clean, sunny and spacious room in a centrally located hotel. Rooms are very spacious with wood flooring that I like. Bathroom a window overlooking the room and overlooking the city. Very nice few if you get the higher floors (ask for floor 3 to above); I got floor 7 (out of I think 8 or 9) and view was great. I did not try it, but the pool is also large enough to do laps. Will try stay here again next time in Balikpapan. 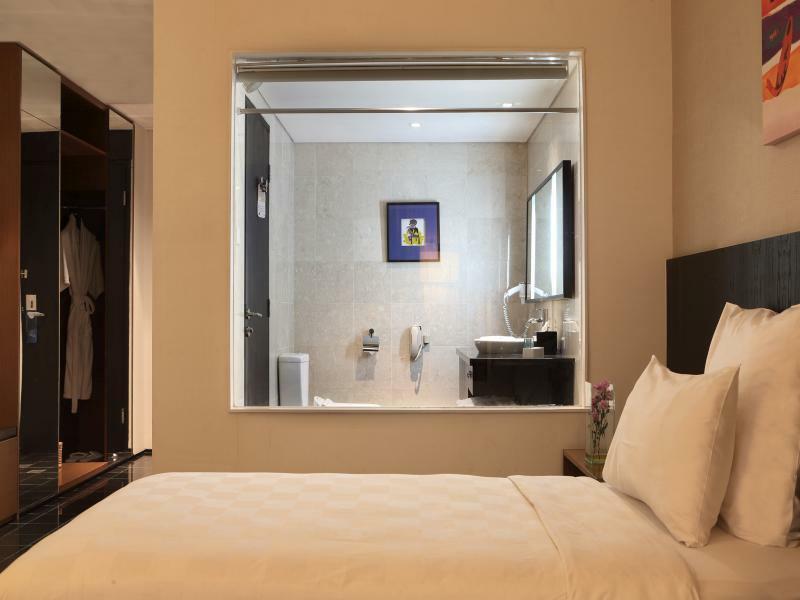 This hotel has nice modern rooms, good furniture and nice bathrooms. 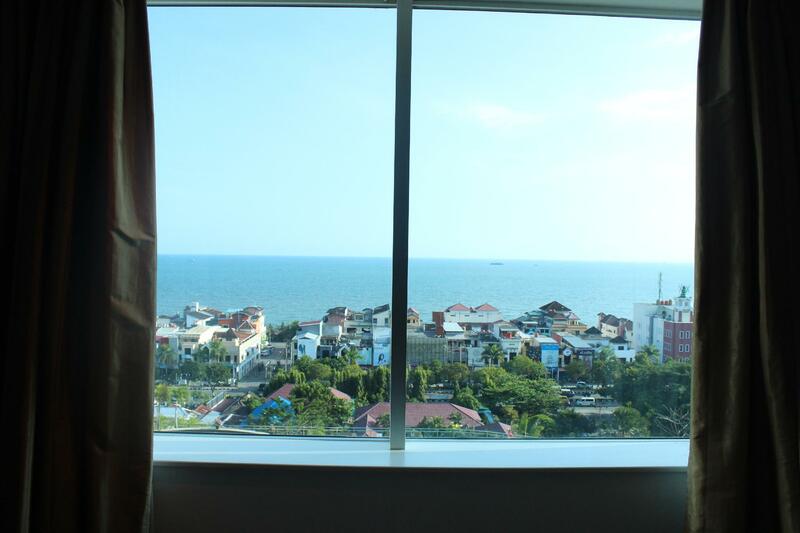 The hotel overlooks the ocean and city and has really nice views. The pool area is really nice and again overlooks the ocean. There is a buffet breakfast and dinner available every night. The hotel is also in a great location in the centre of the city. The swimming Pool is the best. The hotel is well located, and a good quality for business or even for tourist hotel with all complete facilities that you would expect from a good reputable chain four star hotel. The room that I was given a top floor (9th floor) with city view, however they provide very spacious room and clean bathroom. I booked through Agoda that I have very good price and value for money covering room only, and it was excluding breakfast. Recommended/nearby area are shops and cafes. good location, good facility, clean room. placed on heart of city, close to any facility, shopping center, nightlife, cafe. view from hotel room great, directly to the ocean. the facility is complete. swimming pool location is cool, with a view to the ocean. overall, i recommended this hotel for business trip. or maybe for vacation with family. This is by far one of the best hotels we have stayed in. We felt really at home and the room was comfortable. The staff spoke english fairly well and they were very approachable and courteous. The hotel is not on the main street of Jl. Jen Sudirman but just a short walk away. Very convenient for hailing the angkots or any taxis. Value for money stay. We enjoyed ourselves overall. Very nice hotel to stay. We are group of golfers, and my friends are very happy that we chose this hotel. We use the hotel van to travel and the charges were reasonable. We had a good time and enjoyed our golf. Unfortunately, the golf courses in Balikpapan is poorly maintained and we understand this because, being a small town, not many people play this game. Nice location with a beautiful view of the sea. Nice location if you want to have a view of the sea. Its a relaxing place to stay on a business trip , if you get to finish early and just laise around the pool. 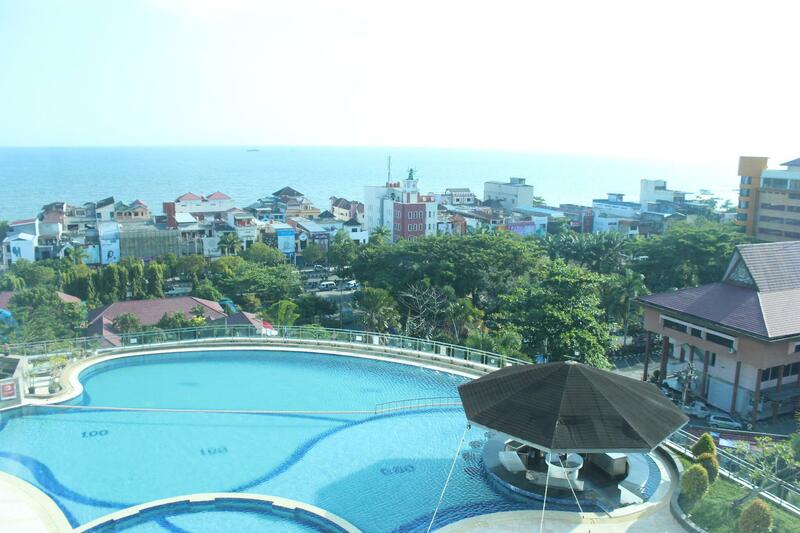 Its one hotel whose pool view is the sea. Easy to move from this hotel to shops and resto's. You get value for money. Staff are helpful but a little bit slow. I stayed with my sister for 5 nights. Over all it was a nice staying. But there was a day that they didn’t cleaned the room except changing the towel and sheets but did not clean up the table. And then one day when we got back, the room was not being cleaned up. After we called for the room service the sheets were quite dirty. It is a old hotel and a lot of the walk way like is not functioning proper and the room access. The breakfast is so oily and almost the same every day. The only good part is the location on of the hotel is central in the city. Hopefully the service can be upgraded soon.